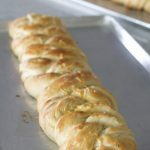 This Braided Cheese-Onion Bread has been a favorite recipe in our family for years! The chewy texture of the bread, combined with ribbons of melted cheese and onions all baked into one beautiful loaf is the perfect companion for almost any main dish. This recipe was first posted several years ago, and has been updated with a few changes! I know it’s not really cool to love bread, but I do. I love almost any type of bread, sweet, savory, wheat, white, dense, light. The combination of the onions and cheese in this homemade bread are out of this world delicious! I like to use a bit of bread flour in this recipe to create a more chewy texture in the bread itself. 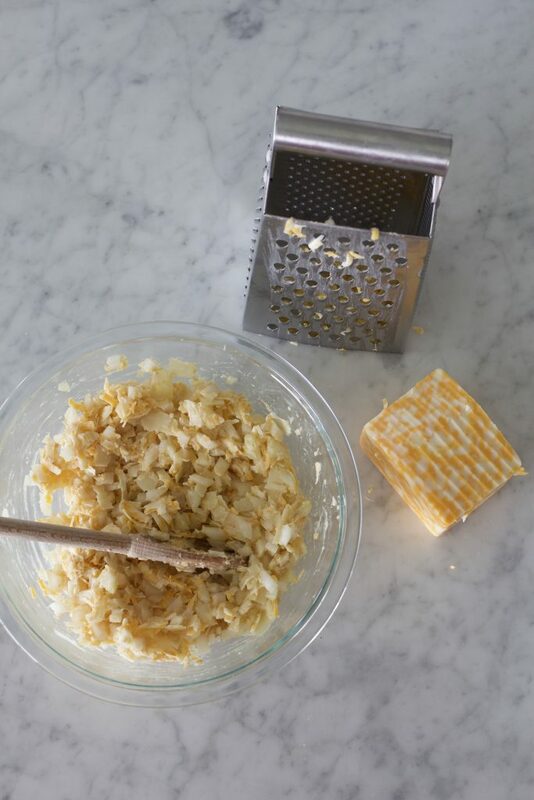 The filling is really simple, it’s just melted butter with chopped raw onions and grated cheeses. The onions cook a bit in the oven so no need to pre-cook. When the bread is baking the aroma is unbelievable. It’s hard to keep the oven door shut and not peek! I’ve heard bakers say braided bread is a lost art! I’m not much of an artist, but I can make braided bread. 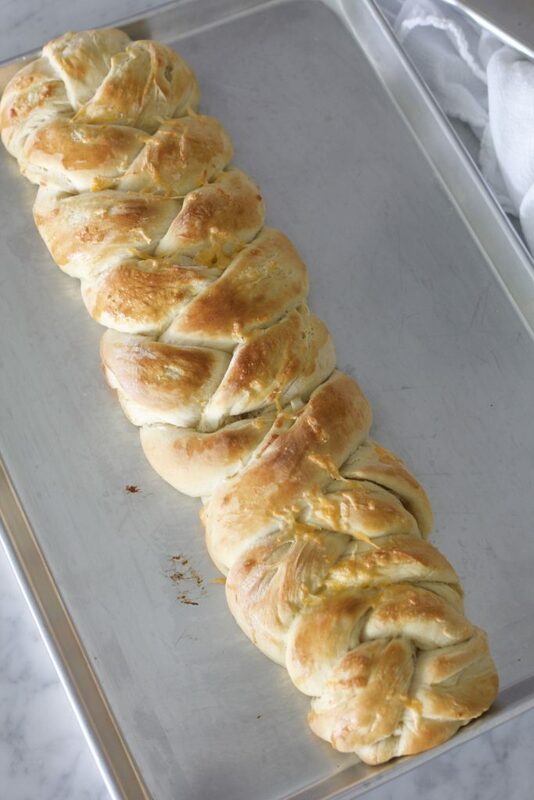 If you can braid your hair, you can make Braided Cheese-Onion Bread. 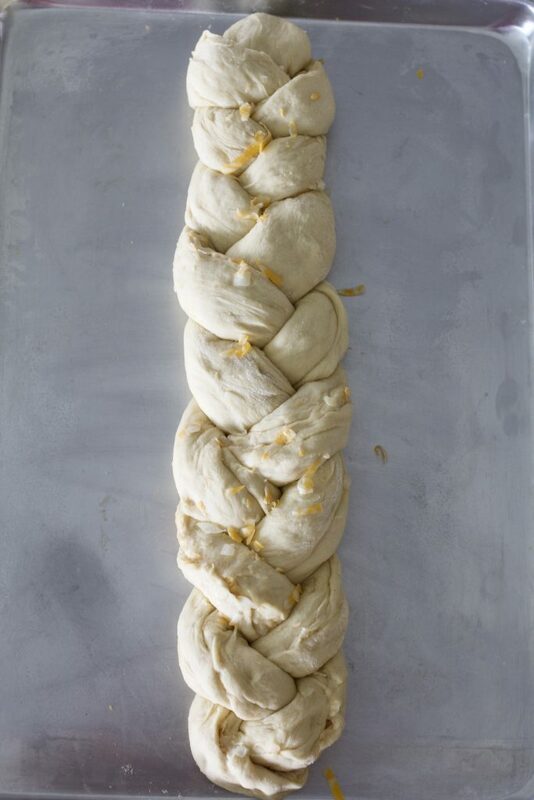 This recipe consists of three ropes of filled dough, braided. The dough is soft and easy to handle. 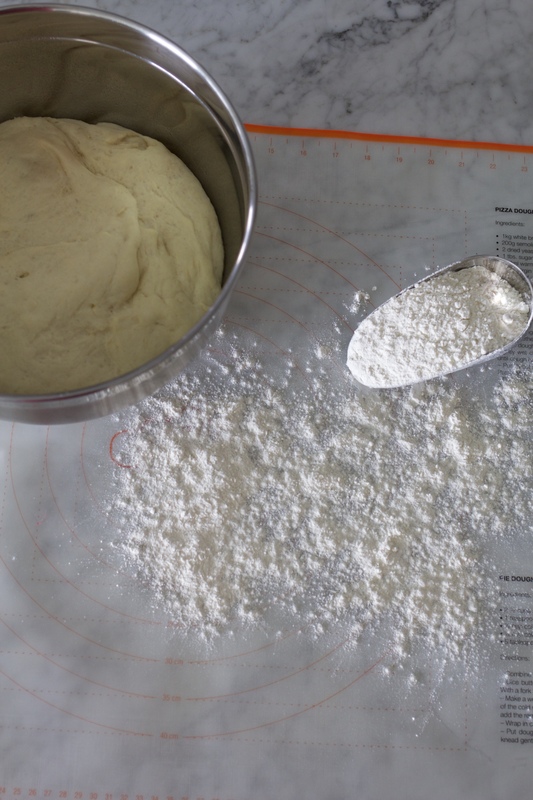 A couple of tips for easy handling of bread dough: Make sure your dough is not overly soft. If the dough is sticky at all when you are finished mixing, it is too soft. The dough should not be shiny at all, it will have a matte appearance. If the dough is at all sticky, add a tablespoon or two of flour and mix again. Tip 2- Don’t be afraid to handle the dough! This dough will not be damaged by handling. If the dough breaks apart when you are braiding or moving onto the cookie sheet, simple pinch the dough back together. Flouring your hands will also make the dough easier to handle. I like to brush the finished braid with a bit of beaten egg for a shiny finished texture, but it is not necessary. I don’t recommend buttering the dough it will not brown up quite as nicely and there’s already plenty of butter and oil in the dough itself. To achieve a more chewy texture, I add 1 cup of bread flour to the dough. I’ve found that after making this bread for years if it’s made with only All Purpose flour, the structure of the dough is a little too soft to support all of the filling ingredients. Also, kneading the bread after all of the ingredients are added to the bowl also helps develop the gluten in the dough and will yield a more chewy bread. the original recipe called for about half of the ingredients in the filling with no grated cheddar. I knew that adding more filling and another cheese would make this bread over the top delicious! Braided Cheese Onion Bread – Any way you shape it, you’ll love it! I usually try to keep the ingredients in this bread a bit under wraps when serving to kids. The first thing a kid does when they hear the “O” word is wrinkle their nose and tell you they don’t like onions. That said, I have yet to meet a person who does not love this bread. Kid, adult, young or old. 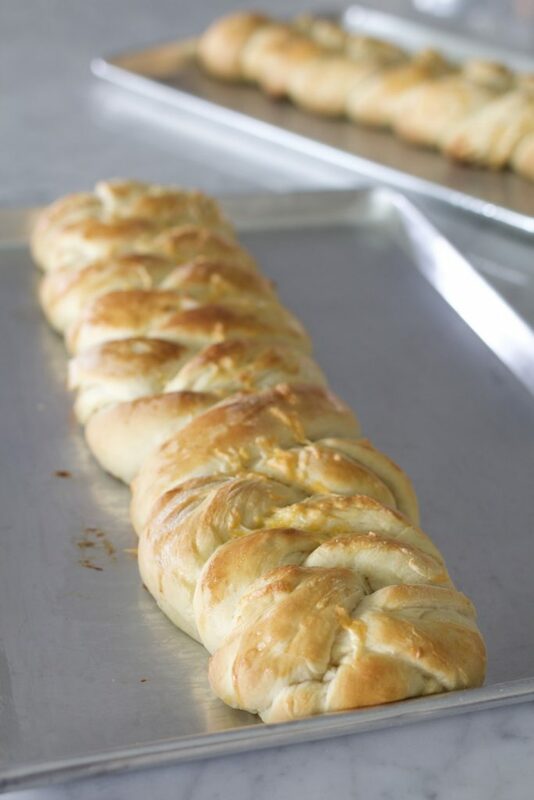 Everyone loves Braided Cheese-Onion Bread! If braiding is out of your comfort zone, try splitting the dough into two pieces roll out about 6×12 and then roll up as you would cinnamon rolls. Cut into 1-1/2 inch pieces and place close together on a greased cookie sheet or a muffin tin. The recipe will yield about 2-3 dozen rolls, depending on size of cut. I like to make rolls for luncheons where the tables are preset. If you are serving this at a table, or on a buffet, slice up about half of the bread (about 1 1/2 inch thick pieces) and leave the other half of the braid unsliced for presentation. Leave the bread knife next to the bread so it can be sliced if needed. The bread may also be pulled apart and not sliced. Because the bread is filled with cheese and a little butter, no need to serve with any other condiments. Hope you love this recipe as much as we do! In a large mixing bowl, mix yeast and 1/4 cup warm water. Sprinkle with 1 teaspoon sugar. Set aside until yeast begins to rise. Add 4 cups flour, melted butter, oil, warm milk, water, sugar, salt and egg to the bowl. Mix until all ingredients are incorporated. I use the paddle attachment on my Kitchen Aid for this step. When all ingredients are mixed and the flour is no longer visible, switch to the dough hook and turn on low for 2 minutes. Scrape down sides of bowl and spray sides of bowl lightly with cooking oil. Cover the bowl and place in a warm place for about 1 hour. Prepare the filling by mixing all of the filling ingredients together in a medium size bowl. Set aside. Flour a clean surface and remove the dough from the bowl onto the floured surface. Roll the dough out into approximately a 12x20 inch rectangle. Spread the filling onto the dough. 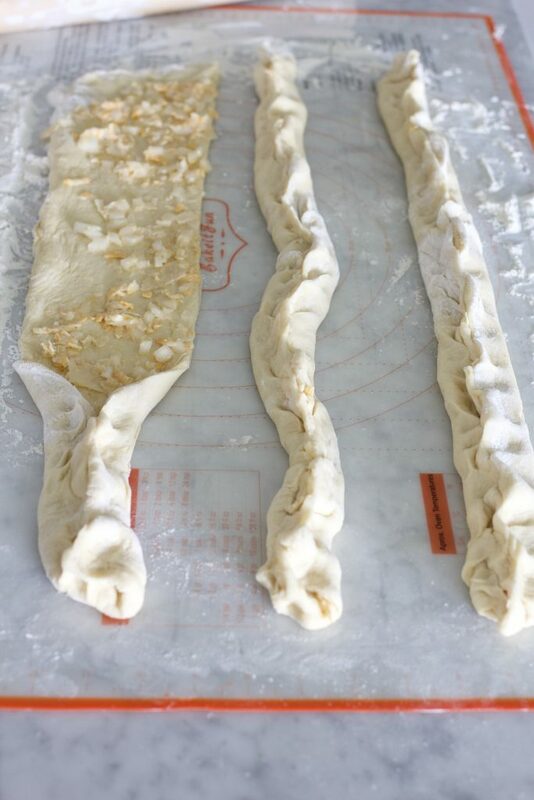 With a knife, cut the dough lengthwise into three ling strips, approximately 4 inches each. You should have 3 strips of dough 4x20 inches when finished. 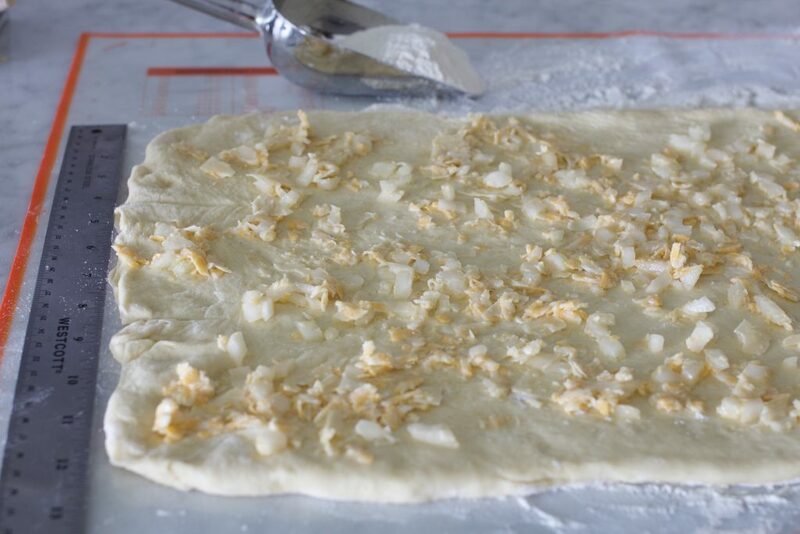 Take each strip and pinch the dough together so the filling stays inside of the dough strip. At this point, you should have three long ropes of filled dough. Place each of the strips of dough onto a jelly roll pan that has been lightly greased or lined with parchment paper. Start with one end and begin to braid the bread, tuck the ends under. Brush with one beaten egg. If you don't have a pastry brush, use your hands to lightly coat the dough with the egg wash.
Let rise in a draft free place for about 45 minutes. Preheat oven to 375 degrees and set the rack in the center of the oven. When braid has risen for 45 minutes, place in oven and let cook for about 35 minutes. The dough should be golden when done. Remove from oven and let cool at least 10 minutes, then slice and serve. You may use 4 cups of all purpose flour if you don't have bread flour. The bread flour simply helps support the filling and creates a chewier texture. This bread may be made one day in advance. Si, will you please adopt me? I promise I will make a great daughter. I will even wash all the dishes without being asked or complaining. Please, please, pleeeeese! Si, I made this bread on Saturday and I think my husband thought I bought it at the store. It turned out amazing! Thanks so much for posting this! Katie, I LOVE that you are a young person, and you are cooking! I made this loaf tonight to go with a salad and it was amazing! I sprinkled the poppy seeds on the outside on the egg wash and it gave great texture. Thank you for the recipe! Hahahahha. Ground beef would definitely make this a MEAL in a loaf. Thanks so much for sharing Clarisa! It says one tablespoon of yeast. Can I use dried yeast? Hi Gina, yes you can use dried yeast. Thanks for asking and for reading ABK! YUMMM! This was much easier to make than I thought it was going to be. It is SO yummy! Made it for my family and we all loved it! Will definitely be making this over and over again. Have you tried this with cinnamon roll filling? It seems it would make a delicious cinnamon bread. Thanks again for another awesome recipe!